Dee Dee Warwick was born Delia Mae Warrick on September 25th 1945, in East Orange, New Jersey.Dee Dee began her musical career singing alongside her elder and more famous sister Dionne Warwick in the family gospel group ‘The Drinkard Sisters’ who were led by their aunt Emily “Cissy” Houston (the mother of the late Whitney Houston). Dee and Dionne later formed their own gospel ensemble ‘The Gospelaires’ who also entered the field of secular music singing backing vocals for many of the hit acts of the late 50’s and early 60’s. Dee Dee later followed her sister as a solo performer when she signed with the iconic songwriting team of Leiber and Stoller who were instrumental in all of her first three solo outings. The original and much covered “Your No Good”( Jubilee 5459) followed by the Van McCoy penned “Standing By” ( Tiger 103 ) and “I Who Have Nothing At All b/w I Can’t Go Back” ( Hurd 79). Dee Dee then signed for the major Mercury label, where she scored a 1965 pop hit with “I Want To Be With You” which first appeared on Mercury’s subsidiary Blue Rock label. Under the supervision of esteemed New Jersey producer Ed Townsend Dee Dee was to record several other excellent sides such as “We’re Doing Fine”, “Gotta Get A Hold Of Myself”, “Worth Every Tear I Cry” (although only an album track in the USA it did gain a 45 release in the UK) before being promoted to the main Mercury label. Mercury released their first album on Dee Dee under the title of “I Want To Be With You/I’m Gonna Make You Love Me” a amalgamation of two of Dee Dee’s biggest hits. With Dee’s original version of “I’m Gonna Make Me Love You” later being covered as a duet between Motown heavyweights The Supremes and The Temptations. In 1969 Dee Dee recorded the first of her two Grammy nominations “Foolish Fool” which was to become the title track of her second Mercury album. It was from this album that a further two tracks “When Love Slips Away” and “Where Is That Rainbow” would later find favour within the UK Crossover/Modern Soul Scene. Other Mercury records of note include Dee’ Dee’s uptempo cover version of the American folk/rock group The Mamas And Papas #1 hit “Monday Monday” along with “Don’t You Ever Give Up On Me” with both songs being of interest to Northern Soul devotees. During 1970, Dee Dee was persuaded by Atlantic records Jerry Wexler to join their subsidiary Atco label. Although a highly prolific time for Dee Dee recording wise, only one album “Turning Around” and five 45 singles were released and subsequently her career stalled. Although one single “She Didn’t Know (She Kept On Talking)” did gain Dee Dee her second Grammy nomination. 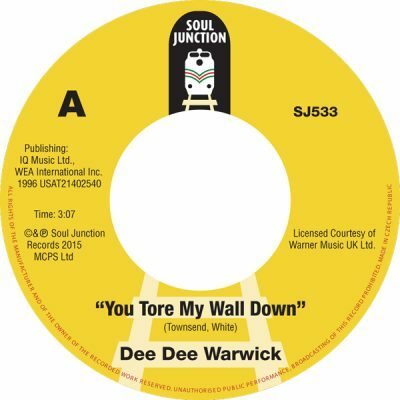 After leaving Atco in 1972 Dee Dee’s next release came in 1975 when she recorded the R&B hit “Get Out OF My Life” under the name change of Dede Warwick for Private Stock Records which featured the excellent “Funny How We Change Places” on the flipside again a popular song with the UK Modern Soul fraternity. Recording wise Dee Dee was dormant until the release of her “Dee Dee” album for Heritage Sound Recordings in 1983, followed by her “Call Me” album for the Sutra label a year later. Sadly after a long period of ill health Dee Dee passed away on October 18th 2008 leaving behind a legacy of great music, with even her more famous sister Dionne claiming that Dee Dee was the real singer in their family. In 2014 The American Real Gone Music label released a double cd album entitled “Dee Dee Warwick, The Complete Atco Recordings” featuring the entire 35 tracks (many previously unreleased) that she cut during her time with Atco. It is from this cd that we have licensed the Ed Townsend composition “You Tore My Wall Down” backed with the equally as good Ashford and Simpson penned “Can’t Wait Until Tomorrow” for their initial vinyl debut on a 45 single.